It’s a big moment for the Commonwealth, as you may have seen in the newspapers recently. On 12th March, Commonwealth Day was celebrated. It’s the world’s oldest political association of states, currently headed by HM Queen Elizabeth II. 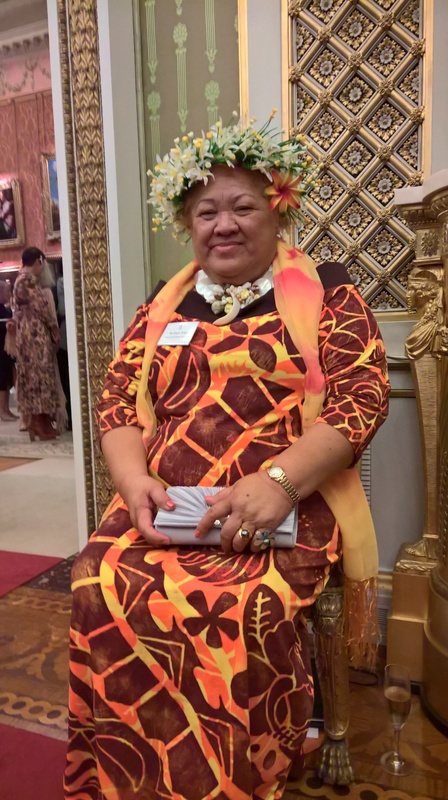 Back in February London Fashion week celebrated the Commonwealth too with a particular emphasis on traditional crafts and skills. 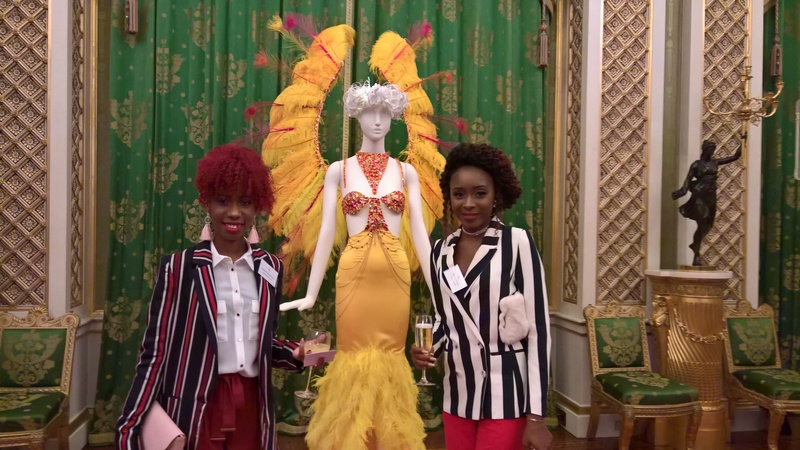 The launch of the Commonwealth Fashion Exchange was followed by an exhibition of work by designers and artisans from all 53 Commonwealth countries at Australia House in London. In a year when we are marking women’s achievements, it was heartening to see so many female artisans and designers represented from across the globe. The reception at Buckingham Palace was held on February 19 and was hosted by the Duchess of Cambridge and the Countess of Wessex with Princess Beatrice. Fiona, CS membership secretary, and I were invited to attend as representatives of the Costume Society. The reception turned out to be a fabulous party held around the exhibits shown in several rooms at the Palace. It was a Who’s Who of fashion...first clue was the red carpet and bank of photographers on the way in (I was way too unfabulous and unfamous to be worthy of a flash bulb). While admiring HM’s collection of old masters in the gallery I turned around to find myself right next to Anna Wintour, editor of American Vogue, and the queen of fashion herself. Guests included other well-known fashion editors: Hamish Bowles, who has curated the Australia House exhibition, Edward Enninful, Suzy Menkes, Justine Picardie, Jess Cartner-Morley and Lisa Armstrong to name a few. I can recognise a journalist, designer, photographer and fellow curator but am hazy on some of the other people who were there. However, there were more than a few supermodels ( so tall! So thin!) Arizona Muse was one I recognised, as well as the unmistakeable Naomi Campbell. Then there were the designers and makers. Within minutes of the reception closing the press had released pictures of Kate and Sophie highlighting what they wore for the evening ( Erdem and Burberry), and British designer Stella McCartney who worked with Burberry, but very few covered the real story of the night. The launch and exhibition are part of a project hatched by Livia Firth (wife of Colin) and her company Eco-Age. Their message highlights sustainability and skill sharing, partnering designers from one country with the crafts and skills of another. Euphemia-Ann Sydney-Davies, a former refugee from Sierra Leone, is now based in England and an established designer. She worked with local makers in Freetown, Sierra Leone, teaching seven men and women the basics of dress-making, cut and construction. Sydney-Davies hopes to create a legacy of craft and inspiration to develop similar workshops. Sustainability is also at the heart of her work. Her latest collection, Gold Rush, includes dresses made from recycled plastic. ‘The idea was that every piece would be a gown’ said Livia. Her cause is to improve economic opportunities and empowerment for many millions of artisans, mainly female, who are low-paid and whose contribution is largely unrecognised. ‘In a world where fashion is fast and brands try to hide the real impact of their endless production cycles, actions speak louder than words. We wanted to create a powerful example of how fashion can be at its best’. The exhibition aims to do more than connect cultures. In a world of fast fashion, worker abuses including forced labour are a constant risk in global supply chains. The handing-on of traditional skills are hugely important, and something which many of the designers took inspiration from. Craft techniques including shell embroidery from the Solomon Islands were showcased in the 30 designs on display. ‘Craft is the second largest employer of women in the developing world’ said Ashia Dearwester of Nest, which supports a global network of artisan businesses. The project aims to bring to life the core Commonwealth values of ‘fairness, economic growth, poverty reduction and female empowerment’ through fashion, as described by Lady Scotland, secretary general of the Commonwealth. Sadly, photography was only allowed in the digital media room. However there is more information about the project and exhibition online, including interviews with designers and artisans.